Marine Gears offers new and re-manufactured marine gears and components. Our products are designed per ABS and AGMA standards, making them the most durable and reliable in the Marine Industry. Our products meet or exceed all industry standards and are built with an emphasis on quality, durability, and dependability. Our state-of-the-art Engineering Department is a leader in the design of marine propulsion equipment from the engine crankshaft to the tail shaft and specializes in reverse-engineering and custom designing. Whether you need a customized design for air pneumatic or hydraulic gears in vertical or horizontal offsets, coaxial inline gear units, or standard units for repowering, changing ratios, or new construction, our Engineering Department can provide the solutions and answers you require. The HRC Coupling Series consists of highly resilient couplings which are produced in three series. The 80 Series allows for maximum angular, radial, and axial misalignment while the 81 Series and 82 Series offer spherical and roller bearings that allow for greater capacities. 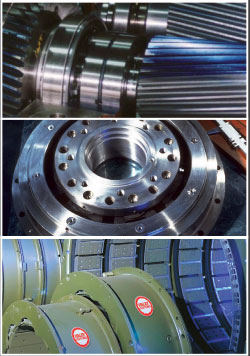 Our Clutch and Coupling company manufactures two series of clutches. The TB Series is designed for exceptionally high torque applications and the TR Series is a torsionally resilient line of clutches which adds significant dampening for torsional vibrations.